download here (267 KB):, which is the third in a series examining the current nature of work, focussing on work which is often home based. The WDC Policy Briefing No.7 e-Working in the Western Region: A Review of the Evidence (download here – PDF 748KB), examined the extent of e-working in the Western Region, examining those in traditional employer-employee relationships, but who work from home, whether full-time or for a period during the working week. This form of working is also illustrated with several case studies of the practice, (download here – PDF 484KB). The second publication in the series, WDC Insights ‘New Work’ – the Gig economy in the Western Region, (download here – PDF 254KB), examined the nature of the gig economy and the extent to which it exists in the Western Region. According to the Census, nationally, in 2011 excluding those working in the Agriculture, forestry & fishing industries, the share of the state’s working population reported as working mainly at or from home was 2.8% (47,127). In the Western Region the share was higher with 3.2% (8,994) stating they worked mainly at or from home. There is a higher rate of self-employment in the Western Region and this is likely to be a contributory factor. Those working mainly at or from home represent a broad range of workers; the self-employed, employees, ‘gig’ workers and e-Workers across a broad range of sectors. They may have very little in common except their place of work, which is less visible than traditional work places. Better data is needed to capture and measure the incidence of all types of work so as to ensure that our policy focus is not limited to the traditional workplace-based employer-employee relationship. Policies are needed to support all employment types and evidence of the nature and extent of work that occurs in the home is required to inform this. Census of Population 2011, the most recent Census data available. Census 2016 data will be available in September 2017. The rest of the data presented in this WDC Policy Briefing exclude those working in the Agriculture, forestry & fishing industries, in order to understand the prevalence of e-working in the wider economy. The WDC wish to thank the CSO for a special run of data excluding those working in the Agriculture, forestry & fishing industries. 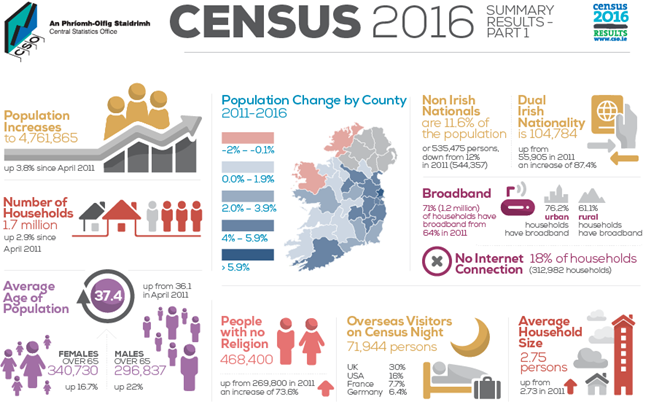 The Summary Results (Part 1) of the 2016 Census of Population were released last week (6th April), with information on population, and corrections to the preliminary results, as well as a number of other statistics giving an overall picture of Irish society. The infographic below, produced by the CSO, provides a picture of the data available. A CSO report with maps and charts on key statistics is available here and a presentation on highlights of the data release is available here . This post discusses some of the information available for the Western Region based on data provided at county level. As more detailed Profiles become available we will be able to present more information at Region, County and ED levels. What is the population of the Western Region and how has it changed since 2011? Since the release of the Preliminary Results which was discussed here the population in most Western Region counties has been amended (in most cases it has been increased slightly, although Galway City population has been reduced). A notable change is that Sligo had, in the preliminary results, a marginal population decrease between 2011 and 2016 but in this corrected data it has actually shown a slight population increase. The Western Region population was 828,697 people in April 2016. The population of the region increased by 7,817 people since 2011 (0.95%). In contrast, between 2006 and 2011 there was an increase of 57,516 persons or 7.5% in the population of the Western Region. The state population in April 2016 was 4,761,865. It increased by 173,613 persons (3.8%) between 2011 and 2016 (Table 1). Two counties in Ireland, both in the Western Region (Donegal (-1.5%); Mayo (-0.1%)) experienced population decline over the period. The highest population growth in the Western Region was in Galway City (4.2%) while Galway County also grew (2.4%). Clare had the next highest population growth (1.4%) while both Leitrim (0.8%) and Roscommon (0.7%) had very small population growth. In all counties (and in the Western Region and the State) there was higher growth in the female population than the male population (See Table 2). In the Western Region there was a 1.6% increase in the female population and 0.3% in the male population. For the rest of the state the difference was not so pronounced (males 3.6%; females 4%). Donegal was the only county to experience a decline in its female population. This difference in the patterns of male and female population growth relates in large part to different patterns of migration and more detailed information will be available on this in Profile 2 (Population Distribution and Movement, release due 11 May) and Profile 7 (Migration and Diversity, release due 21 September). However, Table 3 below shows the differences in the male and female population in each county (using the standard measure of males per 100 females). As would be expected, because women live longer, in the oldest age category (75+) there are significantly fewer males than females. What is more unexpected is that the 30-44 age category has fewer men than women (unlike the age categories above and below it). This indicates significant male migration in this age category. Again, as more detail becomes available the different patterns can be better understood. Galway City consistently has more females than males across the age categories. In this Census 2016 Summary Report the population is not available at ED level. It is expected that this will be contained in the forthcoming release for Profile 2- Population Distribution and Movements on 11th May. Similarly, while the Summary Report discusses urban and rural population the detail is not provided at county level. Some information is provided about age and the map below shows the difference in average age across Ireland. The average age in the state is 37.4 but the average age is higher in more rural counties of the West and North West and in Kerry and Tipperary. In fact Kerry and Mayo have the highest average age (both 40.2) followed closely by Leitrim (39.8), Roscommon (39.7) and Sligo (39.2) while the youngest is in Fingal at 34.3 years. It is useful to examine the dependency ratios in the Western Region. Dependents are defined for statistical purposes as people outside the normal working age of 15-64. Dependency ratios are used to give a useful indication of the age structure of a population with young (0-14) and old (65+) shown as a percentage of the population of working age (i.e. 15-64). Nationally, the total dependency ratio was 52.7% while that in the Western Region was, as would be expected, higher at 57.4%. 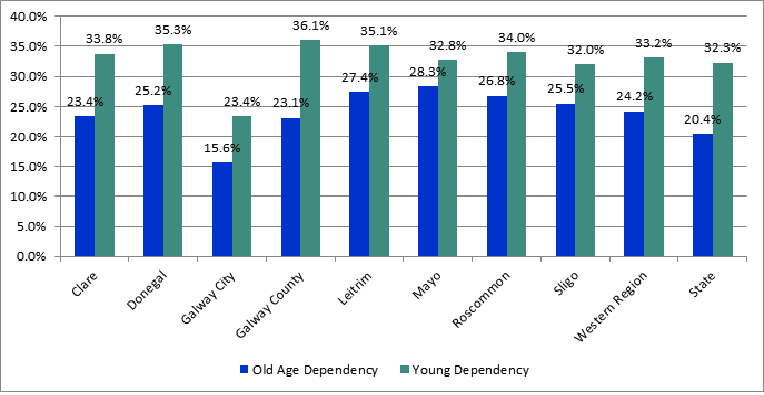 Leitrim had the highest dependency ratio of any county at 62.6 per cent, closely followed by counties Mayo (61.0%), Roscommon (60.8%) and Donegal (60.5%). The lowest dependency ratios were in Galway city at 39.0 per cent, followed by Cork city (42.8%), Fingal (50.7%) and Kildare (51.4%). Over the coming months to December 2017 data from Census 2016 will be released under various headings. This important information gives us the opportunity to better understand our region and its characteristics. It is essential for policy and decision making, as well as to our understanding the differences among regions in relation to a variety of issues such as economic output, social transfers and the demand for different goods and services. We look forward to analysing the future releases and to providing a better understanding of the Western Region throughout 2017. The Preliminary Results are based on the summary sheet for the Census form while this release is based on the information in the complete Census form. Rest of state refers to all the counties in the state except for the seven counties of the Western Region. How is the Western Region doing? On 31 January, the WDC was invited to give a presentation to officials of the Department of Social Protection working across the Western Region. The objective was to give an overview of the WDC’s analysis of data across a range of socio-economic issues. These are some of the key points emerging from the analysis. Population of Western Region grew +0.9% 2011-2016 compared with +3.7% growth nationally. Three counties in the Western Region showed population decline 2011-2016 –(Donegal -1.5%, Mayo -0.2% and Sligo -0.1%) – only counties in Ireland to do so. In addition Leitrim and Roscommon had the lowest growth. Galway city had 5th highest population growth in Ireland. Every county in Ireland had a positive natural increase (more births than deaths) during 2011-2016. Donegal, Sligo and Mayo however had enough negative net migration to lead to population decline. All western counties, and all but six areas nationally, had negative net migration between 2011 and 2016. Donegal and Sligo had the two highest rates of negative net migration. Male out-migration considerably higher than female leading to a +1.5% increase in the female population of the Western Region and only +2% growth in the male population. The Western Region’s labour force declined marginally (-1.2%) between 2007 and 2016. Within this the male labour force fell by -6.1% while the female rose by +5.7%. The Western Region has a lower share of its labour force aged under 35 years and a higher share aged over 44 Its labour force participation rate is lower for both men and women, and across all age groups (except 65+). There has been exceptionally strong growth in self-employment in the Western Region since 2012, increasing by +31.1% in the region compared with +7.2% in the rest of the state. Unemployment numbers declining steadily in region, but share of long-term unemployment growing. Western Region has higher unemployment rate in all age groups (except 65+ & 25-34) and particularly among youth. Disposable income per person in the Western Region was €17,260 in 2013 (92.3% of State). Provisional 2014 figures show some growth (€17,768) but still well below the 2008 peak (€21,167). Longer term, the gap is narrowing, the Western Region had disposable income of 84.3% of State in 1995, 92.3% of State in 2013. Within the Western Region, Roscommon had a significantly lower income relative to the State in 2014 (87.2%) compared with 2005 (95.8%). 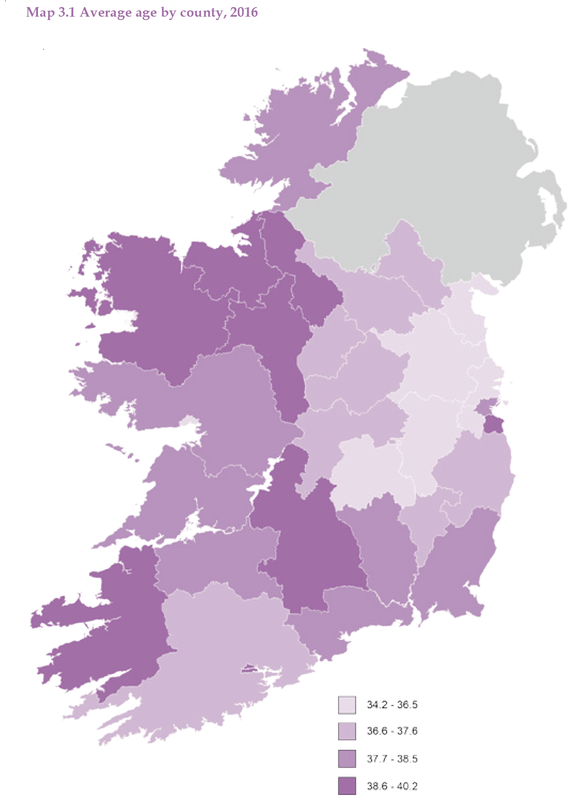 Clare has also fallen relative to the State starting at 95.5% in 2005 and dropping to 93.3% in 2014. Sligo, Galway, Mayo and Donegal have all improved their position relative to the State since 2005, albeit with some variation. Galway and Sligo had greatest improvements. Dublin region is the only region where the preliminary 2014 GVA per person figure is higher than the peak GVA per person in 2007. None of the other regions have recovered to the 2007 level, though the difference in the West region is slight. Dublin and Mid-East and South West, only regions with a greater share of national GVA than share of persons at work. In 2005 there were 60.6 index points between the lowest GVA per person in a region (Midland, 65.4) and the highest (Dublin and the Mid-East, 126.0). In 2014 the difference between Midland (59.2) and Dublin and the Mid-East, (130.6) was 71.4 index points (71.3 in 2013). The share of enterprises nationally that are based in the Western Region is declining and was 17.1% of the total in 2014. Construction, Wholesale & Retail, Professional activities and Accommodation & Food Service are the largest enterprise sectors in the region. Less than 5% of the region’s enterprises are in Financial & Insurance and Information & Communications combined. There has been a far greater decline in enterprise numbers in the Western Region than the rest of the state since 2008 and the region had a weaker performance – greater decline or lower growth – in every sector (ex. real estate). The enterprise base differs across more urban and rural counties. Highly rural counties of Roscommon, Mayo and Donegal have 34-36% of enterprises in Industry and Construction but in more urban counties of Clare and Sligo it is around 30%. A higher share of enterprises in Galway and Sligo are active in knowledge services sectors, though even Galway is below national average. Local services play a larger role in more rural counties. Western counties had among the greatest losses of enterprises since 2008. Donegal lost more than 1 in 3 of its Construction firms; Wholesale & Retail declined most strongly in Donegal and Clare; Accommodation & Food Service declined across most counties. Knowledge services performed best, though from a low base. https://www.wdc.ie/wp-content/uploads/WDC-Insights-on-Western-Region-cover-1.png 826 1168 WDC https://www.wdc.ie/wp-content/uploads/wdc-567.png WDC2017-02-02 12:51:132017-02-02 15:18:02How is the Western Region doing? The WDC has just published its analysis of the CSO Business Demography data (2011) which shows there were nearly 31,000 active enterprises operating in the Western Region. At 0.057 the average number of enterprises per working age person in the region was lower than that in the rest of the state (0.062). Overall the Western Region’s enterprise base was more significantly damaged by the recession than elsewhere. Between 2006 and 2011 the decline in enterprise numbers in the Western Region was nearly twice that in the rest of the state (-18.4% compared with -9.8%). The region’s largest enterprise sectors experienced the greatest declines. Some sectors did show growth. Enterprise numbers in ‘education’, ‘information and communications’, ‘real estate’ and ‘professional, scientific and technical activities’ increased. While growth in these knowledge intensive sectors is very welcome, they continue to be less important to the region’s enterprise profile. The Western Region has a less diverse enterprise profile than the rest of the state. It has a higher share of enterprises in sectors that mainly serve local, domestic or tourist markets, while knowledge intensive services account for a lower share of the region’s businesses. The region’s more urban counties tend to have greater enterprise diversity, with rural counties’ economies more concentrated by sector. Note: This report was completed in late July, prior to the very recent publication of the data for 2012. The WDC’s analysis of the 2012 Business Demography data will be published soon.